If you're still writing workout programs on papers/spreadsheets, and sending them over email to your clients, you already know how difficult it is to juggle schedules, track real-time progress and manage communication with all your clients. But.. TrainerFu is here to change that. We've made lives of personal trainers and their clients 10x simpler by creating a platform that seamlessly runs on all popular platforms (Web, iOS and Android), and provides a sophisticated ecosystem for complete workout management. Now, whenever you assign that exercise to the client, they'll be able to view the custom exercise video you just created, and get guidance on how to complete that exercise. As you scale your business, it becomes challenging to onboard clients and keep track of their progress on a daily, weekly or monthly basis. Using TrainerFu, you can create re-usable workout templates to quickly onboard clients, and get them started with their training program. Apart from reducing the activation gap for onboarding, you can even optimise the time spent per client by creating upcoming workout plans. Once you've created a multi-week upcoming plan for your client(s), they'll automatically be assigned new plans every week, without the need for any manual inputs. TrainerFu helps you unlock an added source of revenue -- remote training. While you can only have a limited number of personal training clients, you can easily manage tens of remote clients, as they don't occupy much of your time bandwidth. All you have to do is create a workout plan for them, and track their progress, on a weekly or monthly basis, right from the TrainerFu app. TrainerFu allows you to get 360 degree view of your client's health by pulling up fitness data from popular apps like MyFitnessPal and Fitbit, and posting the meal updates, right into the news-feed. Based on the captured insights, you can analyse, whether they're following the suggested nutrition plan, or there's need for some re-calibration. While meal-logging helps you measure the nutrition aspect, TrainerFu also allows you to track, capture and visualise detailed body assessments, so that you can measure the overall effectiveness of your workout plan. For instance, you can log metrics like 1RM, weight, body fat percentage, etc., right into the TrainerFu app, and track their progress over time. When you're running a multi-week bootcamp/group training sessions, you really don't want to spend too much time writing workout programs and sending out emails. Ideally, you want to get them started with the workout schedule, with as much little effort as possible. With TrainerFu, it's really easy to host multiple group trainings/bootcamps. Just save your workout schedule for the bootcamp/group training as a plan template (only once! ), and easily re-use the saved template to create a multi-week plan for all your clients. 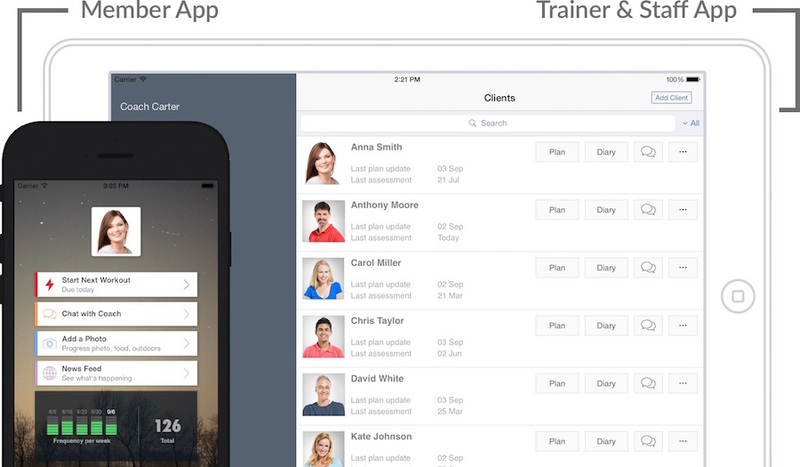 Apart from being a workout management app, TrainerFu is also a collaborative app for managing your fitness business. Using the news-feed, you can post announcements, share fitness advice or provide instant feedback on all the latest client activities. It's a great way to stay connected with your clients, especially when you're growing your business, and managing workout plans through emails or messages becomes an unscalable strategy. For fitness trainers, who are looking to promote their business online, TrainerFu offers a lot of benefits. For instance, any update/photo that's posted on the news-feed can be instantly shared on other social media platforms like Facebook, Instagram or SnapChat. The app also comes bundled up with an amazing feature called Progress Photos. As the name suggests, your clients can automatically create a "before-now" photo, just by logging their photos on the app on a timely basis. At TrainerFu, our goal is to help personal trainers build a super-successful fitness brand. And that's the reason we offer an exclusive custom branding (or "white-labelling") plan for trainers, who want to customise the training experience, to suit their personal fitness brand.